Joe DeGuardia’s Star Boxing presented the latest edition of the ‘Rockin fights’ series last night at the Paramount in Huntington, NY before a completely sold out crowd. The main event saw Hicksville, NY native Anthony “Showtime” Karperis, improve to 15-3 5KO with an impressive 10 round unanimous win over the ever so tough and game Nicaraguan, Nelson Lara, who falls to 17-10-4 9KO by scores of 100-90, and 99-91 on the other two judge’s scorecards. The bout was contested in the jr. welterweight division. It was a fast-paced action fight as Karperis, displayed great hand speed and impressive combinations throughout the 10 round bout. Lara, to his credit never stopped coming forward as he was more than willing to exchange punches with Karperis. Both fighters gave it their all, but it was Karperis in the end coming away with a hard fought and well-earned victory. Tyrone “Pretty Boy” James improved to 7-0 3KO as he dispatched Brazilian, Alex Duarte DeJesus at 1:45 in the 3rd round of a scheduled 6 round jr. welterweight match up. Both fighters exchanged freely to the delight of the crowd. It was close affair after 2 rounds with each fighter scoring significant punches. James was the flashier of the two combatants and put together a beautiful three punch combination that had DeJesus attempting to hold on and survive. James, to his credit, wouldn’t allow any time for survival as he closed the show with a vicious onslaught as referee Al LoBianco Jr. stepped in and called a halt to the action. 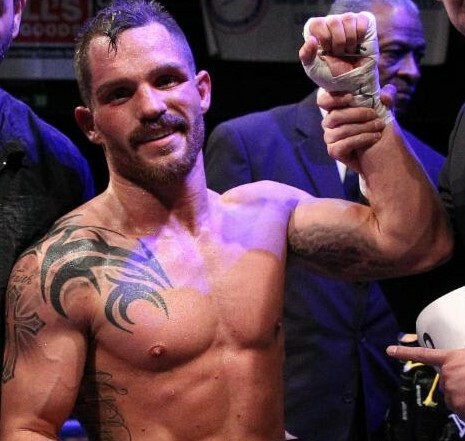 42 year-old Scottish born cruiserweight Shaun Kennedy made his pro debut against 1-5 Darius Flowers in a scheduled 4 round cruiserweight bout. The Huntington based entrepreneur Kennedy had a huge and loud following cheering him on as entered a professional ring for the first time. Kennedy started out well by dominating the action, until he ran into a straight right hand thrown by Flowers which dropped him. The game Scotsman beat the count, but was then caught by a sharp left uppercut causing referee Tony Chiarantano to put an end to things at the 2:42 mark of the 1st round. Flowers improves to 2-5 2KO while Kennedy goes to 0-1. Huntington based Jr. Welterweight Wendy Toussaint, 8-0 3KO, continued to impress as he stopped Rochester’s Saadiq Muhammad, 4-2, at 1:12 of the 1st round of a scheduled 6 round jr. middleweight fight. Both guys started well engaging each until a beautiful straight right hand by Toussaint caught Muhammad flush on the temple. Muhammad slumped into the ropes and referee Danny Schiavon stepped in and stopped the fight as he was dazed and hurt. Promoter Joe DeGuardia had these thoughts on the night’s affair “This was our 29th event at the Paramount and once again the fighters performed to a sold out crowd. The atmosphere was electric all night and once again Long Island Boxing fans show why they are among the best. Congratulations to all the fighters who participated on the show and we look forward to our next event here at the Paramount on March 16th”. Is this the last chance for David Price to prove he can mix it with the top heavyweights?